Did DMA's Have to Grow Up So Fast? On their second album, For Now, Britpop revivalists from Down Under DMA's grow up too soon. The Sydney-based trio's early EPs were scrappy-yet-thoughtful indie pop/rock that had a naïve, do-it-yourself rawness to them, epitomized by their signature neo-shoegaze anthem "Delete". Their 2016 debut album, Hills End, was co-produced by Australian engineer Dylan Adams (the Hives, James Blake) and mixed by big-budget professional Spike Stent. 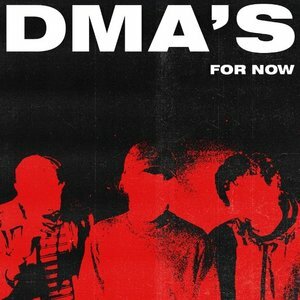 The added bit of studio polish only enhanced DMA's strong songwriting, though, and gave their youthful energy more room to come through. A rush of great tunes and heartfelt emotions, Hills End was one of the best indie debuts of the last couple decades. Late in 2016, DMA's performed a straightforward, acoustic version of Cher's "Believe" for Australian radio station Triple J's Like A Version series. A stunning showcase of singer Tommy O'Dell's all-natural, unaffected vocal abilities (he used to be a drummer), the video outperformed "Delete" as DMA's most-viewed. On their second album, the band have taken that power-ballad theme and run with it. For Now is a stately, slow-moving affair that is almost completely devoid of the cathartic, youthful energy that made the debut so special. There is plenty of crooning and emoting from O'Dell and there are some hummable, even memorable tunes. At times, though, For Now is remarkably dull, serving as the relatively indifferent placeholder its title might imply. The start is promising. The title track kicks things off with a propulsive bassline, shuffling drums, and a bit of a swagger, channeling the best of the 1990s Manchester scene. "Dawning", the album's best pop song, follows. Full of effortlessly soaring melody and a windswept grandeur, it's not as catchy as the singles from Hills End but it is almost as winning. From there, though, For Now drifts into navel-gazing mode and pretty much stays there. The production, this time aided by Kim Moyes from Australian synthpop band the Presets, is surprisingly flat. Synthesizers and electronic rhythms are employed, but unfortunately the clear intent was to recall the over-digitized, blanded out sound of a Corey Hart record circa 1986. It's a different kind of retro effect, to be sure, but not necessarily a welcome one. Strangely, many songs have a vague, tremolo-effect guitar churning in the background, as if guitarists Matt Mason and Johnny Took are struggling to break free. What's frustrating is that the material is good enough that, were it complemented by more dynamics and some energetic rock songs, it might have been much more effective. "Time & Money", for example, has a satisfyingly lovelorn moodiness and a great performance from O'Dell, but never really gets past its loping, poorly-programmed beat, instead searching for a second gear that never arrives. "The End" is one place where DMA's new adult contemporary approach pays dividends. A weepy disco track that almost didn't make the album, it gets a boost from a smooth, groovy bassline, wistful chorus, and soulful backing vocals. There's no question that if Adele were singing, it would be all over the radio. "Emily Whyte" sends For Now off in gorgeous, affecting fashion, with the shuffling drums returning and the gently-strummed acoustic guitars finally finding their place. It's a grown-up song from a grown-up band, but it hasn't come without a price.